minxeats - recipes, recaps, and restaurant reviews: The Tournament! I've mentioned the Mason Dixon Master Chefs Tournament here a few times in the past, but today I am going to go into more detail. Why? Because this past Monday, August 2, I had the honor of being an expert judge and I want to share my really fun experience with you. But first, let me tell you more about the competition. 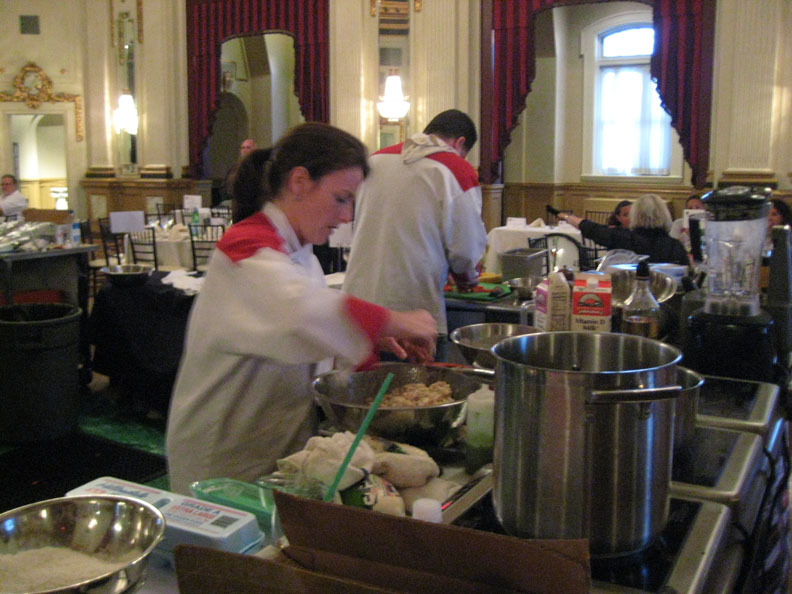 The Tournament pits pairs of chef/sous chef teams against each other in a series of hour-long cooking contests. Thirty-two chefs entered the competition which started way back in May. After a sixteen-battle first round, the winning chefs are currently going head-to-head in the second round, which ends on August 10th. The ultimate challenge of the competition comes on September 13th when two finalists will battle it out for the ultimate title of Mason Dixon Master Chef. The event is being held at the Belvedere Hotel, in a ballroom on the very elegantly-appointed 12th floor. On the evening I attended, the competitors were caterer/cooking instructor Sarah Mogol of The Bountiful Experience, and Mark Dunaway of "upscale crabhouse," Canton Dockside. As the chefs set up their stations, guests were able to mingle during Happy Hour and then dine on a multi-course meal provided by Truffles, the Belvedere's resident caterers. Critical wench that I am, I have to nit-pick on the fact that the "intermezzo" of a rather clunky cantaloupe sorbet was a bit redundant after an appetizer that consisted primarily of cantaloupe and honeydew melon with an odd selection of accompaniments (bits of olive, shreds of sundried tomato, a tiny bit of brie, and prosciutto). My entrée of sliced beef filet, however, came with a plethora of vegetables and a crispy onion topping and was overall quite nice. Chef Sarah Mogol prepares her bread pudding. 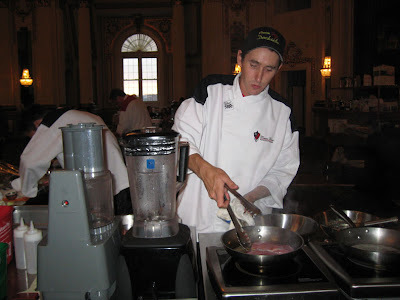 During the final throes of our dinner, at 7:30, the competitors were given 30 minutes to do "cold prep." Chef Mogol's team took great advantage of this time, as much of her team's food involved chilled elements. At 8 PM, the competition began in earnest as burners went on and meat started sizzling..
At this point, most of the guests were on their feet around the cooking stations, watching the teams preparing their three-course meals. I was impressed that both chefs were very calm and collected as they worked, even as emcee Jerry Pellegrino peppered them with questions about their dishes and wandered around their kitchens behind them. Chef Dunaway sautéing duck breast. At the end of an hour, the chefs beauty plates were presented for the diners to admire while the expert judges - Damon Hersh of the Tournament's charitable partner Movable Feast, Ted Stelzenmuller of Jack's Bistro, and me - took our seats and awaited the tasting portion of the program. 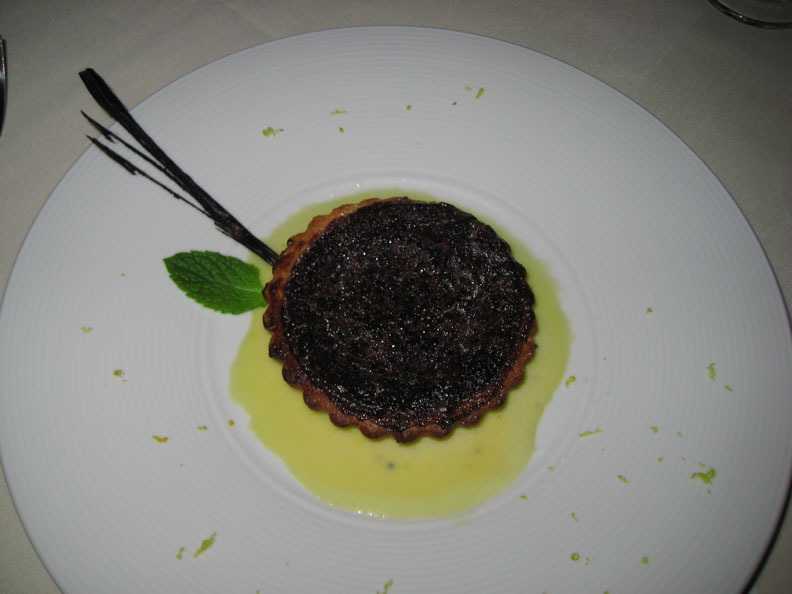 We were brought our food in six courses, one dish at a time, rather than receiving both apps, etc., simultaneously. This made it easier to judge each dish on its own merits, rather than comparing them to the other dish in the category. 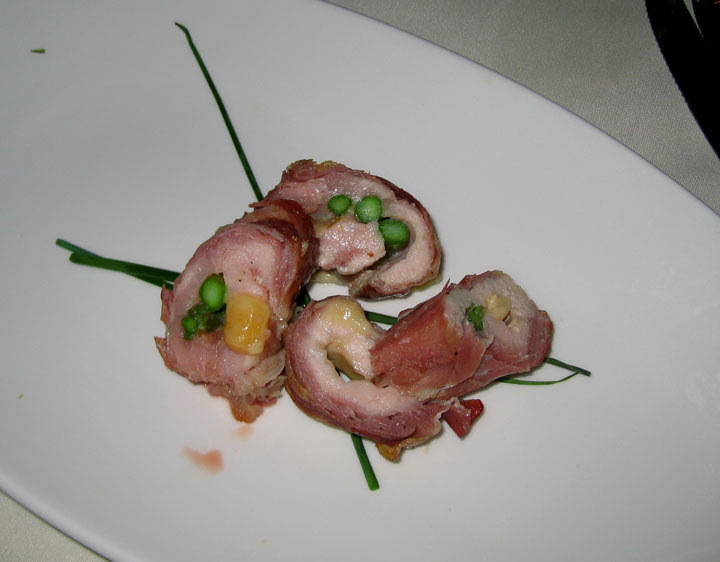 First we received Chef Dunaway's appetizer, his version of saltimbocca, done as a roulade of Prosciutto-covered veal stuffed with asparagus and gouda cheese. While the presentation was nice, the veal was a bit chewy and gristle-y and overall the dish suffered from a surfeit of salt. Chef Mogol's app was a play on tomato soup and a grilled cheese sandwich. The chilled soup, plated in concentric circles of pink and yellow flecked with green, had a light and refreshing flavor with the perfect balance of acid and seasoning. The accompanying French toast-style sandwich with mozzarella cheese fell flat by comparison; the bread was too thick and lacked the crisp crust that is integral to the whole creamy/crunchy soup and grilled sandwich experience. Also on the plate was a salad of shaved asparagus and cheese. While refreshing and light and nicely seasoned, there was no need for another acidic element in the dish. 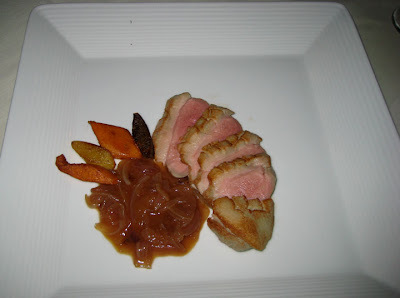 Salt once again proved to be Chef Dunaway's undoing in his entrée of duck breast with onion marmalade and multi-colored potatoes. The meat was beautifully pink and juicy but was as salty as ham. 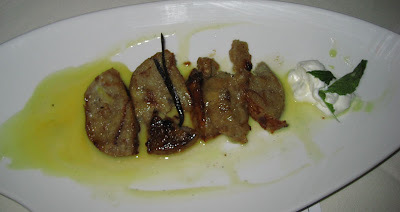 Disappointingly, the fat had not been rendered nor the skin crisped. The onion component was a nice sweet counterpoint, but the cute potato shapes were a bit too precious and insubstantial. A better choice would have been a green vegetable to break the monotony of the mostly-brown plate. Chef Mogol also had difficulty with her duck breast. It was a bit overcooked and was presented with none of the fat or skin. 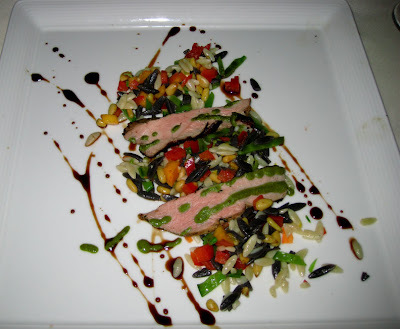 It was accompanied by a wildly-colored cold salad of orzo, peaches, asparagus, pine nuts, and assorted other vegetables, a cilantro sauce, and a balsamic drizzle. There were far too many components on the plate, which might have worked better without the cilantro sauce. Although it is my favorite herb, I thought it added a cacophonous note to an already overly-busy dish. From the other side of the room, Chef Mogol presented a bread pudding made with Buttershot schnapps, on a pool of more creme Anglaise, plus a tiny dollop of sweetened whipped cream on the side. I loved the butterscotch flavor, but thought the pudding would be more successful with a scoop of ice cream - olive oil gelato perhaps - and a nice pinch of sea salt. Chefs Hersh, Stelzenmuller, and I had to grade these six dishes in three categories, giving up to 8 points each in plate presentation and creativity, and nine in the category of taste. Additionally, there were audience members who paid for the ability to try the food as part of the "Judge Experience," plus some randomly-drawn "Guest Judges" who were able to add their input on the competitors' entrée courses. After all of the points were tallied, Chef Sarah Mogol emerged the victor. Personally, I had a great time. I met some ladies who loved to eat, talk about food, and watch cooking shows - girls after my own heart! Being a judge for a live competition was a little strenuous because I had to come to my conclusions about the food pretty quickly. After a few chews, the emcee was handing us a mic so we could tell the chefs what we thought about their dishes. It was gratifying to know that my opinions weren't all that different from those of the two professional chefs at my side - or maybe we just had the same sensitivity to salt. :) In any case, it was fun and I would do it again in a heartbeat. Congratulations to Chef Mogol for making it into round three, and kudos to Chef Dunaway as well for putting himself out there. Hopefully the competition will get attention for both of them and their businesses. And for all of the other participating chefs as well. Tickets are still available for the remaining contests. Please go to http://www.masondixonmasterchef.com/purchase-tickets/ if you're interested in attending. Thanks for the review. Sure sounds like an amazing experience. Not to nit-pick but only 30 chef competed for the title. Maybe 2 chefs dropped out at the last minute. The Web site said "32 teams" so I assumed there were also 32 chefs. Which of course would make sense.